Eagle Pass, TX, July 1, 2006 -- UCSD engineers affiliated with Calit2 this week unveiled a novel wide-area, multiple camera, computer-vision system for monitoring a key U.S.-Mexico border crossing between Eagle Pass, TX and Piedras Negras, Mexico. The prototype system will be used to detect and deter criminal activity and ensure smooth traffic flow around the Camino Real International Bridge which crosses the Rio Grande River and serves as a commercial thoroughfare between Texas and Mexico. 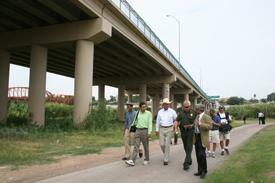 UCSD's Mohan Trivedi and officials from local and federal agencies tour the area covered by the Eagle Eyes surveillance technology system. The Camino Real toll bridge is managed by the City of Eagle Pass, and following a demonstration for city and state officials and a tutorial for police officers, the Eagle Pass police department began using the system to observe critical locations under and around the bridge. The video surveillance system, dubbed “Eagle Eyes,” was developed by UCSD electrical and computer engineering professor Mohan Trivedi and his team of graduate students and researchers. “Eagle Eyes will serve as both a working prototype for the police department and a real-world experimental testbed for continued UCSD research into advanced distributed interactive video arrays for safety and security, ” said Trivedi, whose work has received more than $1 million in research contract support from the federal interagency Technical Support Working Group responsible for combating-terrorism technology research, with approximately $100,000 for development of the system at Eagle Pass. “This new system will allow us to more efficiently and effectively protect lives and property around this vital point of international commerce between Mexico and the U.S.,” said Juan Antonio Castaneda, Eagle Pass Chief of Police. Castaneda explained that the police are particularly interested in thwarting drug trafficking, Mexican bandits and transport of illegal aliens. 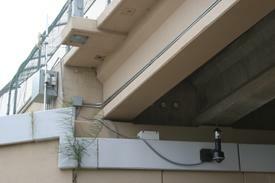 Omnidirectional and pan-tilt-zoom cameras give police a wide area view of regions around and under the Camino Real bridge. The collaboration between the Eagle Pass Police Department and UCSD was facilitated by the Border Research and Technology Center (BRTC), which serves as a technology resource for law enforcement, corrections and public safety agencies along the U.S.-Mexico border. The BRTC has operations in San Diego, and is a program of the U.S. Department of Justice-National Institute of Justice’s National Law Enforcement and Corrections Technology Center (NLECTC) system. "It is wonderful to see the advanced science and technology developed by the University of California, San Diego assisting the people of Texas," said Chris Aldridge, western director of the BRTC. "We believe that this will become a valuable platform that may be modeled by other law enforcement agencies protecting our bridges and borders." Computer interface allows police to precisely select location to be viewed and zoom in on area of interest. 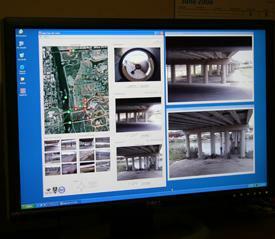 The system includes three networked cameras mounted on the Camino Real bridge: a stationary omnidirectional (360-degree view) camera which will give the police a wide-area view of the entire bridge as well as the nearby international pedestrian bridge and railroad bridge, roads and river banks; and two pan-tilt-zoom cameras -- one with infrared nighttime vision -- which will allow police to zero in with high resolution to locations and objects of peak interest. The cameras are linked to a control room in the Eagle Pass customs building via a secure wireless connection. It is one of the few systems to use omnidirectional cameras and wireless connections in an outdoor setting. Eagle Eyes runs with Trivedi’s custom software which helps capture, analyze, encrypt, transmit, and display visual information. Key to the system is the ability to recognize suspicious activity in critical hot spots such as an unfinished roadway under the bridge. If the system detects unusual movement, it will immediately flag the video stream. Calit2 participant Mohan Trivedi at Eagle Pass border crossing bridge. The three video cameras allow police to triangulate the exact location of any person or object in view. Police monitoring the video in the control room also have the ability to control the cameras and use a joy stick to zoom in on an object—such as a license plate or face--in high resolution, even at night. In the case of a traffic incident, police could use the system to pinpoint the location and extent of injury and damage, which will enable them to quickly dispatch appropriate help. Trivedi and his team at the UCSD Jacobs School of Engineering and the California Institute for Telecommunications and Information Technology have been working on the TSWG video surveillance project since 2002, and began the collaboration with Eagle Pass about one year ago. All of the Eagle Eyes features are scrupulously tested and verified on an exact replica of the system located on the UCSD campus, before being deployed at Eagle Pass. Trivedi says he and his team will be working over the next year and beyond to add new system capabilities tailored to the needs of the Eagle Pass police. 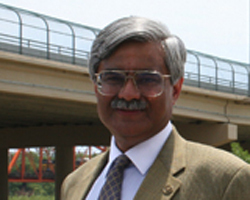 Trivedi’s Computer Vision and Robotics Research Laboratory deployed a team of researchers to work on the technologies showcased at Eagle Pass. They included: Tarak Gandhi (panoramic and multi-camera systems); Kohsia Huang (digital televiewer and real-time tracking); Steve Krotosky (interactivity and graphical interfaces, system architecture); Jeff Ploetner (wireless video and system architecture); Anup Doshi (color-based tracking and event detection); Ramsin Khoshabeh (motion analysis); Brendan Morris (vehicle detection and tracking); Quinn Kennett (wireless video); and Sangho Park (activity analysis concepts).